Workflow diagrams is the acknowledged method to draw the process flow which have concerted set of flowchart symbols you use for depicting work process steps or relations. 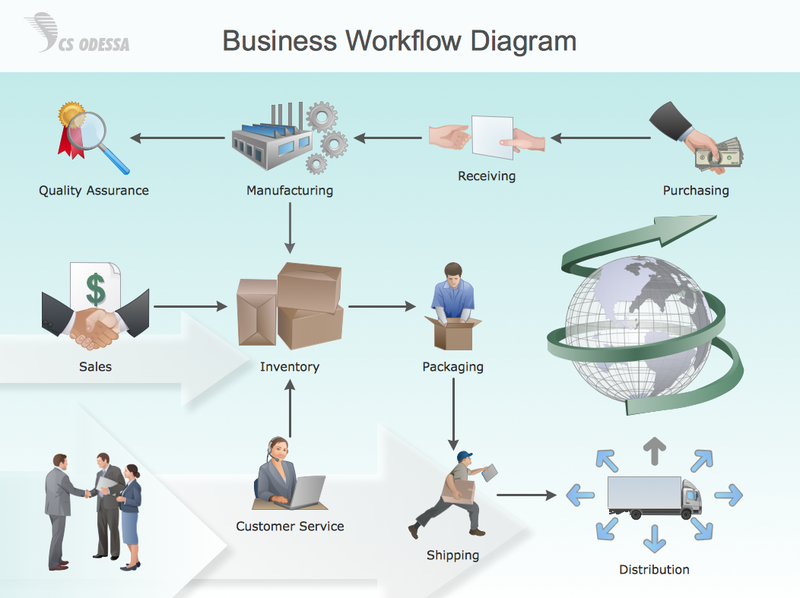 There are many cases when you need inhance your workflow diagram to be professionally looking and add some rich illustrative graphic. 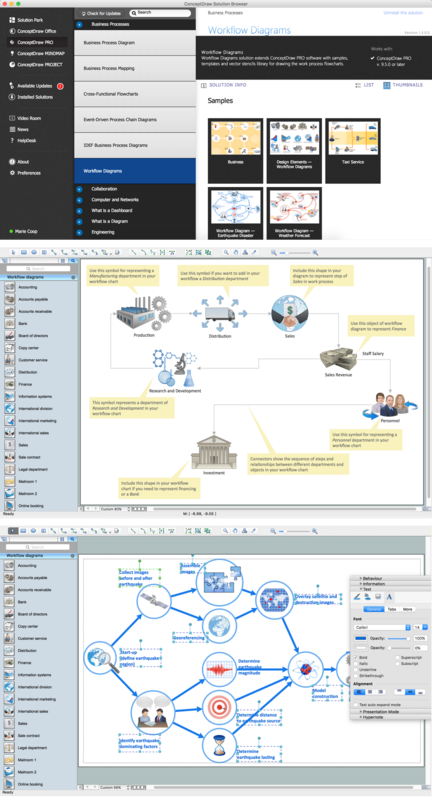 ConceptDraw DIAGRAM extended with the Workflow solution delivers rich set of workflow diagram symbols helps you make your workflow better-suited for presentations. 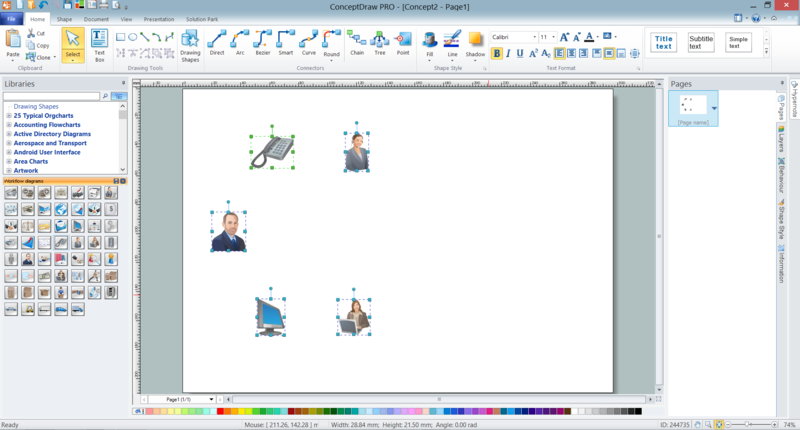 ConceptDraw DIAGRAM is a professional drawing software for workflow diagram design. The part of this software is the Workflow Diagrams solution that adds library of vector stencils for providing a set of tools and features that allow users to accurately diagram workflow scenarios. 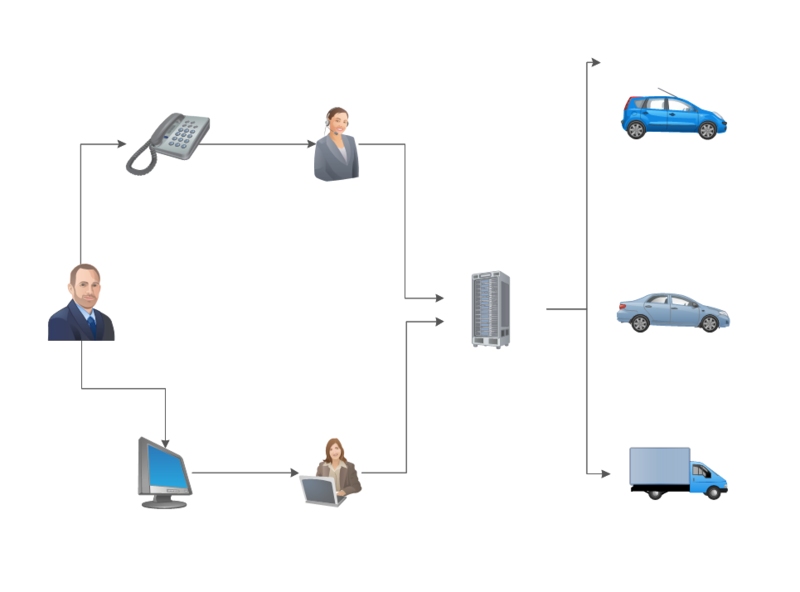 Workflow diagram lets to represent the transferring of data, documents, and tasks during performance of a work process, helps show relashionships between process steps and understand the complete process, identify critical stages and problem areas. The Workflow Diagrams solution extends ConceptDraw DIAGRAM software with samples, templates and library of instantly recognizable vector stencils for effectively drawing Workflow diagrams. type the text, resize the objects if needed and recolor connectors according to your taste. Another way is to start with ready Workflow Diagram template also included to Workflow Diagrams solution and offered by ConceptDraw STORE. 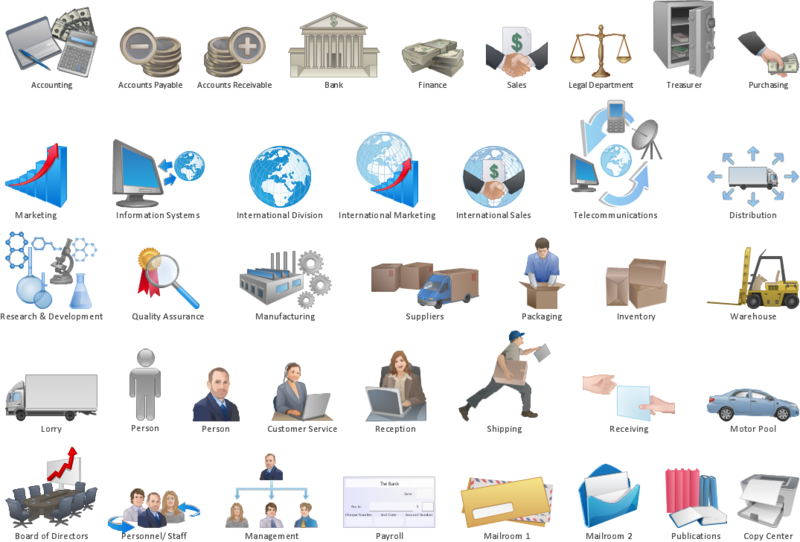 When modifying template, use also symbols from the variety offered by Workflow Diagrams library to represent different types of actions and the steps in a workflow, among them are the objects of persons, accounting, bank, accounts receivable and payable, customer service, manufacturing, marketing, distribution, quality assurance, and more others. 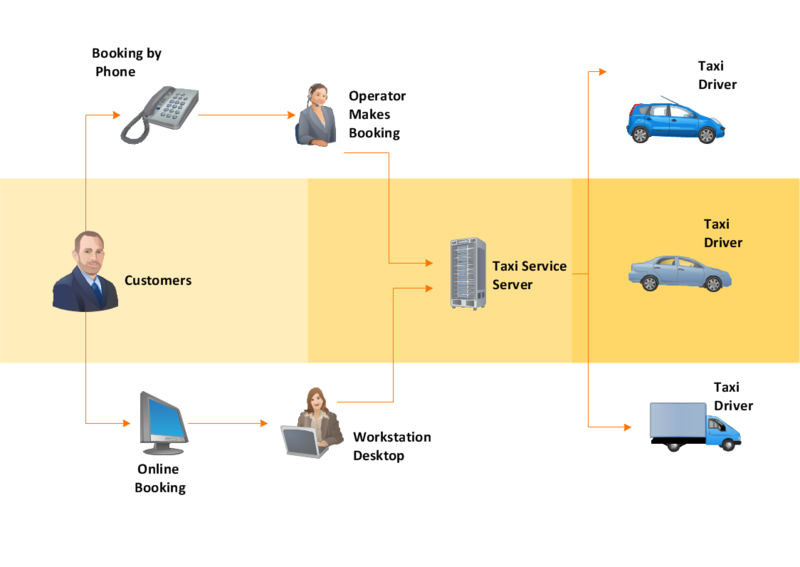 When it comes to creating a Workflow Diagram, it's important to use software that is capable of describing a wide range of processes, using easily recognizable techniques and graphical notation. An ideal drawing platform will utilize functions that can cope with the output of a high volume of processes, that may change rapidly from development to implementation stages. ConceptDraw DIAGRAM software, with the extended functionality of the Workflow Diagrams solution, is the ideal medium for creating even the most complex designs of this type.